Commodities got smacked hard across the board on Thursday with silver and crude leading the way. Silver is now down close to 30% from the peak, and crude is down close to 13% from the peak four days ago. 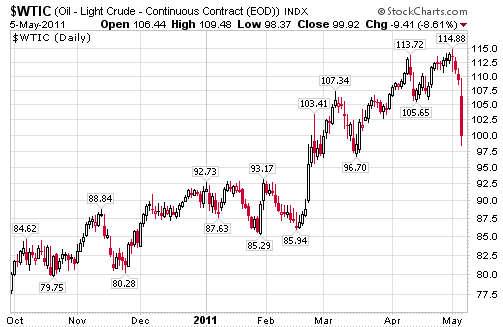 The rest of this post deals specifically with crude. Discounting the civil war in Libya and Mideast disruption concerns in general, there is no fundamental reason for crude to be above $100. 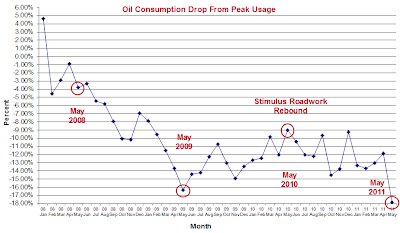 Attached please find some charts on petroleum distillates demand. 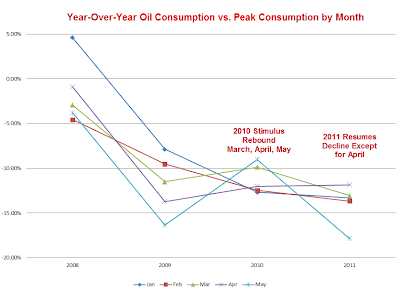 These are based off peak demand, which for the USA was Feb '07 to Jan '08. Those are the highest months of demand in our history. Demand has never approached those numbers again. As you can see on the first chart, titled "Year-Over-Year vs. Peak", the months of January through May are measured against the peak years for 2008 to 2011. Note that except for April, this year is by far the biggest drop off peak in this depression. This May has begun with a significant drop off last year after a big rise off 2009. Last May more than likely reflects the rebound on "shovel ready" paving projects that ate up a lot of distillates products. This May has begun with the first week showing scary down numbers! Needless to say we need to look again at the rest of the month, but this is the worst week of the year to date. 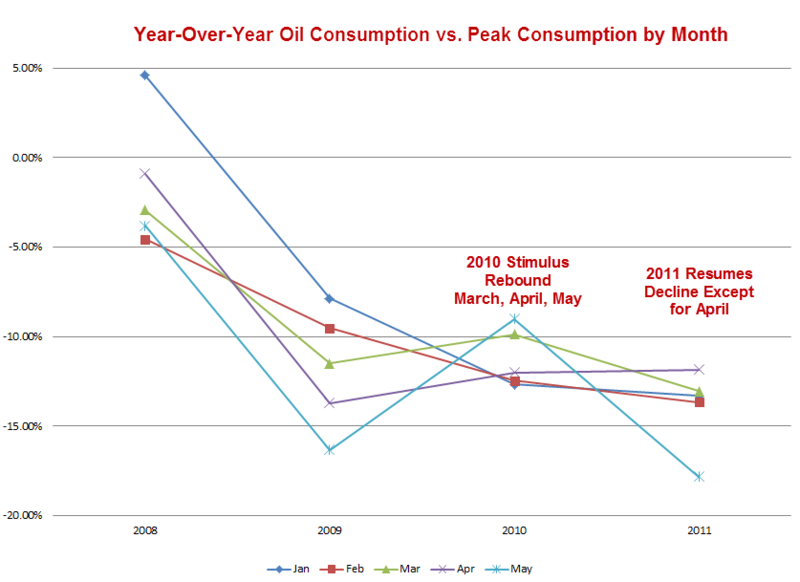 The second chart shows each month by year off the peak period. May is off to a rocky start. It will be very interesting to see how this May ends up. 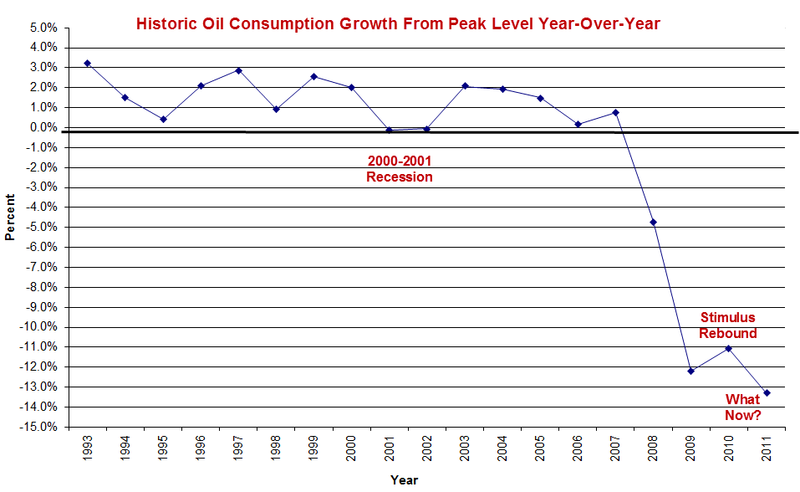 The third chart shows how the historic petroleum distillates demand has trended since the early '90's. 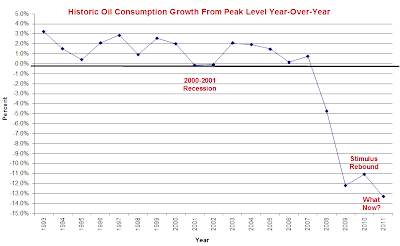 I learned back in the '70's in my days at Exxon that any demand growth of less than 0.8% showed a weak economy, anything less than 0.5% was recessionary as you can see in the recession of 2001/2002 on the chart. Look at the numbers now and tell me where we are headed. 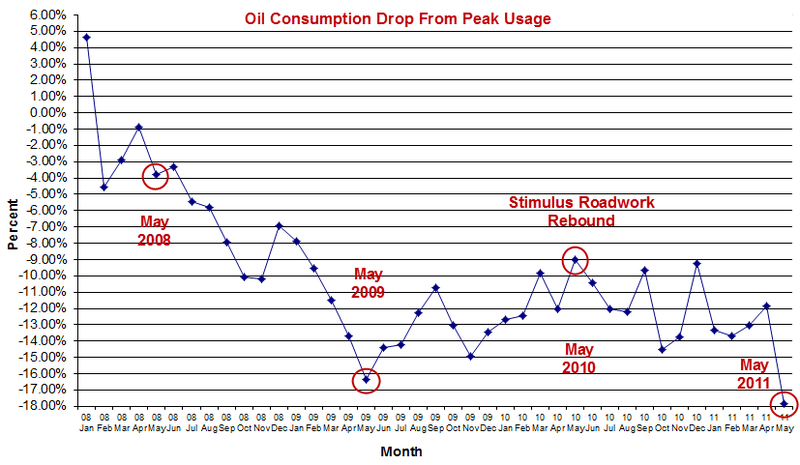 For all the brouhaha over the "recovery" one cannot see it in oil usage. However, you can see it at the pump! You can also see it in oil futures speculation. 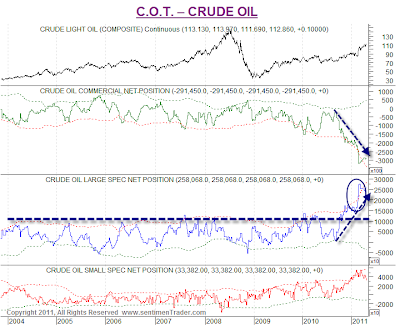 Here is a chart of oil futures Commitment of Traders courtesy of SentimenTrader. Annotations in blue on the chart are mine. Jason Goepfert at SentimenTrader was kind enough to allow me to post the chart. Note that futures volume went through the roof earlier this year as shown by the blue oval. For those not familiar with futures, for every long there is a short. Big Speculators (typically hedge funds, pension plans, etc), are long record numbers of futures. The commercial traders have taken the other side of the bet. Rules of the game are simple: someone has to take the other side of the trade because for every long there is a short. The commercial traders may be producers willing to sell into the spike or they may be market makers. One certainly cannot use this information as a timing device, but it is interesting to see everyone plow into this "sure thing" trade right as demand has collapsed. Unwinding this trade can easily collapse the price of oil and send the US dollar higher, and I think it will.